Castlefarm is an award winning organic dairy farm and farm shop where you can participate in farm tours and local food tastings and buy delicious food direct from where it is grown and prepared. 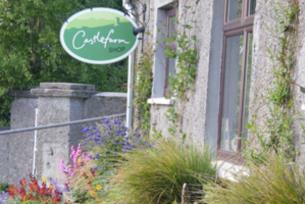 Castlefarm Shop is an exciting shopping experience set on a 170 acre organic farm near Athy, Kildare. Castlefarm Shop opens the last weekend of every month and specialises in organic beef, vegetables, pork, eggs, honey, apple juice and cheese all produced by Jenny and Peter Young. The shop specialises in other local produce and speciality foods including home baking, ice cream and preserves. Castlefarm Shop offers a food hamper service to those who want to give gifts of good food. On the days that the shop is open visitors can enjoy monthly complimentary food talks, farm walks, help collect eggs and watch the cows being milked. Castlefarm welcomes group tours and school tours and rents out allotment plots to people who want to grow their own food. Castlefarm has been nominated one of Ireland's top 100 food destinations and been awarded four Bridgestone plaques. Castlefarm has been certified organic since October 2009. This means no chemicals, no sprays, no gmo’s, just natural farming and happy, healthy animals. School Tours at Castlefarm: A tour of Castlefarm allows you to learn about where real food comes from in a fun and safe environment. A walk around the farm allows you to meet our cows, calves, hens, pigs and ducks. You can see our bee hives and visit our milking parlour and foraging hedge.